We really enjoyed our stay at this hostel. The atmosphere was great and the staff helped you the best way they could, so they organized a real turkish hamam for us. We also really liked the pub crawl, which was organized by Ugur and he got us in all the local bars you couldn't enter as a tourist. All in all it was an amazing stay! Beautiful hostel with a nice Rooftop Bar and a perfect view. The hostel is only a few minutes away from the best sights in Istanbul. You can book a cheap shuttle to the airport and different activities like a River Cruise. Breakfast is really good and the Ladies who serve the Food are pretty friendly. The Staff is friendly and helps with any questions and problems. Perfect hostel I had a great time there. 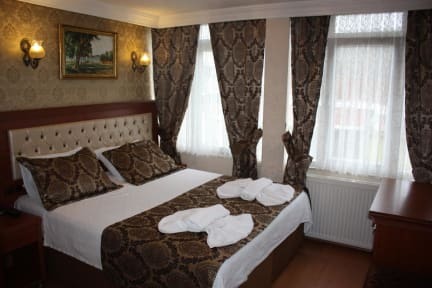 Big Apple Hostel is a hostel located in the heart of old town in Istanbul. Blue mosque, Hagia Sofia and Tram/Metro station are all in walking distance. But on top of this all, the hostel really feels like a safe and homey place to go back to after a long day. The staff is very friendly and helpful, rooms are cleaned every day. 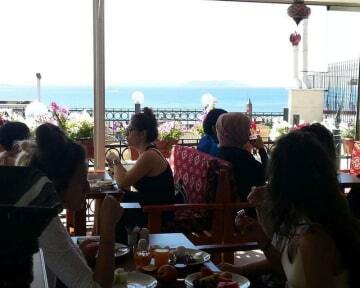 And you will have a healthy and fresh breakfast on the rooftop terrace with sea view. Thank you for a great stay. Actually I just stayed 1 night because I had just a stopover in Istanbul. The hostel is fantastic. I slept in the 14 bed dorm. The room is very huge and comfortable. There is enough space to move around in the room. Every bed good his own locker and the room itself has 3 bathrooms in it. The hostel was really clean and the staff is totally friendly. The hostel is really close to the blue mosque and the main touristic places. Next time I’m back in Istanbul i would go there again. I really liked the hostel, everything is at the highest level! and cleanliness , and food, the staff is totally friendly , will always help in everything! thanks to this hostel has found a good Friends. The hostel is really close to the blue mosque and the main touristic places. Next time l‘m back in Istanbul I would go there again. Thanks for every thing 😊😊!! Das beste Hostel auf unserem Roadtrip durch die Türkei. Top Lage, nur wenige Minuten zu Fuß zur blauen Moschee und weiteren Highlights. Tolle Atmosphäre auf der Rooftop Bar. Sehr netter und aufmerksamer Barkeeper mit guten Party Tipps. Lage und Preis-Leistungsverhältnis unschlagbar. Dafür ist aber im Hostel nicht viel los und auch in der Rooftopbar war nicht viel los... Es war auch nicht besonders sauber und die Mitarbeiter sind nicht sehr auskunftsfreudig. Beim nächsten Mal würde ich wieder ein Hostel am Galatatower nehmen, dort trifft man mehr junge Leute.